Senseware was founded with many core innovations that we now see driving today’s leading-edge IoT applications. Senseware has executed on their strategy of creating a rich collection of IP assets central to the rapidly emerging market for IoT smart building services. Senseware’s IoT Platform delivers broad horizontal support across the complete spectrum of PropTech industry verticals that require real-time data and visualizations. The patent for invention number 10,171,972 covers data forwarding configuration that enables cloud-to-cloud integration of IoT platforms. The patent for invention number 10,171,891 covers modular hardware expansion of wireless sensor nodes to facilitate broad IoT sensor support. The patent for invention number 10,149,141 covers a wireless BACnet node that retrieves data from remote sensor devices using the standardized digital communication protocol of modern building control networks. The patent for invention number 10,143,038 covers the wireless beacon transmission of RFID status updates based on local sensor measurements. The patent for invention number 10,142,196 covers the efficient retrieval of sensor data through Senseware’s innovative Universal Sensor Interface. These five inventions cover key platform tools that enable Senseware’s partners to build full-stack IoT applications for rapid delivery into their target markets. 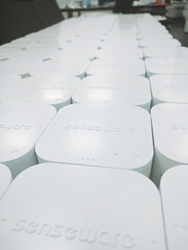 Senseware remains focused on delivering tightly-integrated hardware, software and cloud solutions that connect our partners to critical building assets, Big Data, and real-time visualizations. “Senseware was founded with many core innovations that we now see driving today’s leading-edge IoT applications. We invested heavily in our technology and IP portfolio,” said Serene Almomen, CEO, Senseware. “It is incredibly satisfying to have received such validation of Senseware as a true technology company,” she said. Senseware, located in Vienna, VA, is a leader in developing IoT smart building solutions that combine hardware, software and real-time cloud services. Additional information about Senseware can be found at http://www.senseware.co.